When it opened in October 1864, Camp Lawton was called “the world’s largest prison.” Operational only six weeks, this stockade near Millen, Georgia, was evacuated in the face of advancing Federal troops under General Sherman. In that brief span of time, the prison served as headquarters for the Confederate military prison system, witnessed hundreds of deaths, held a mock election for president, was involved in a sick exchange, hosted attempts to recruit Union POWs for Confederate service, and experienced escape attempts. Burned by Sherman’s troops following its evacuation in late November 1864, the prison was never reoccupied. Over the next 150 years, the memory of Camp Lawton almost disappeared. In 2010, the Confederate military prison was resurrected—a result of the media event publically showcasing the findings of recent archeological investigations. 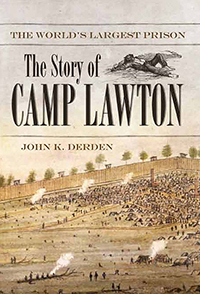 This book not only summarizes these initial archeological findings, but is also the first full-length, documented history of Camp Lawton.